They were already distinguished by their size, noticeably more compact than those of the other Breitling for Bentley models, and suited to all wrists. With the new special all-white “Ice” versions, the Bentley GT and Bentley GT Racing chronographs now also display a look that is well off the beaten track. This original and sophisticated appearance features an Ice White dial – an exclusive Bentley livery colour – teamed with a rubber strap in the same shade. The faces of these exceptional sports models, enhanced by rimmed counters, evoke the dashboards of the finest Bentley Grand Tourers. The bezel with its knurled raised motif is reminiscent of the characteristic control buttons of the prestigious British carmaker. 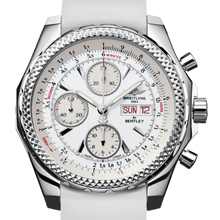 In terms of the chassis, the Bentley GT Ice chronograph has a steel case with an all-polished finish, while the even more sophisticated Bentley GT Racing Ice version is distinguished by finishes alternating between satinbrushed upper surfaces and polished sides; and its caseback bears a medallion with the outline of the famous Bentley Continental GT, the epitome of power and elegance representing the quintessence of the Grand Tourer tradition. These two watches are driven by the selfwinding Breitling Calibre 13B chronograph movement, chronometer-certified by the COSC and equipped with a calendar displaying the day and date through a large twin aperture at 3 o’clock. 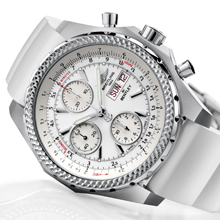 The bidirectional rotating bezel serves to activate the “variable tachometer”, a world-exclusive Breitling feature. When used in conjunction with the chronograph, this system enables the user to measure mean speed whatever the time elapsed, the distance covered or the speed reached. Bentley GT Ice and Bentley GT Racing Ice: grand style follows its own road. Movement: Breitling Calibre 13B, offi cially chronometer-certifi ed by the COSC, selfwinding, high-frequency (28,800 vibrations/hour), 25 jewels. 1/4th second chronograph, 30-minute and 12-hour totalizers. Day-date calendar. Case: steel. Water-resistant to 100 metres. Screw-locked crown. Bidirectional rotating pinion bezel with variable tachometer (circular slide rule). Cambered sapphire crystal, glareproofed on both sides. Diameter: 45 mm.